Pete Jordan, the former Pittsburgher best known till now as the zine-maker “Dishwasher Pete,” returns Monday with a new book about another obsession. Jordan’s an inveterate bicyclist. In fact, he left Pittsburgh in 2001 partly because the town was so inhospitable to bikes. Most U.S. cities weren’t much better, he adds. But one place was: Amsterdam, his home for more than a decade and the subject of In the City of Bikes (Harper Perennial), his history of cycling there. Jordan comes at biking neither idly nor as a recreational rider. He studied urban planning in Amsterdam, and he says more bicycling is a big way to make cities more livable (and, not coincidentally, more environmentally sustainable). However, he's not concerned with weekend warriors in Lycra on fancy road bikes, but rather with everyday people riding everyday bikes to everyday places, like work and the grocery store. In Amsterdam, where he lives with his 7-year-old son, biking is simply the way things are done. American friends have often asked, on his return visits, whether he saw a big difference with biking today. So many more riders, eh? “Actually, it was kind of hard to tell the difference,” Jordan recently told CP via Skype from his home in Amsterdam. Where he lives, the streets are filled with bikers all day. In supposedly bike-friendly New York City, at rush hour, he’s seen the bike lanes filled … with pedestrians. Asked about typical reasons Americans give why biking isn’t more common here, Jordan offers some surprising insights. American motorists, for instance, often complain that cyclists don’t follow traffic rules. Amsterdam cyclists, too, have an anarchic reputation, one stretching back a century: They ignore stoplights, don’t employ lights for night riding, and eschew helmets. Yet there’s almost no conflict with motorists. Jordan says as an everyday biker in the U.S., he averaged one run-in a day with a motorist. In Amsterdam, he hasn’t had one in years. Partly, he says, that’s because most drivers are bikers, too, and know what’s up. He adds that while U.S. traffic laws treat bikes as cars, even though they’re much smaller and slower, in Amsterdam, bicycles are their own class of vehicle, which helps traffic flow. 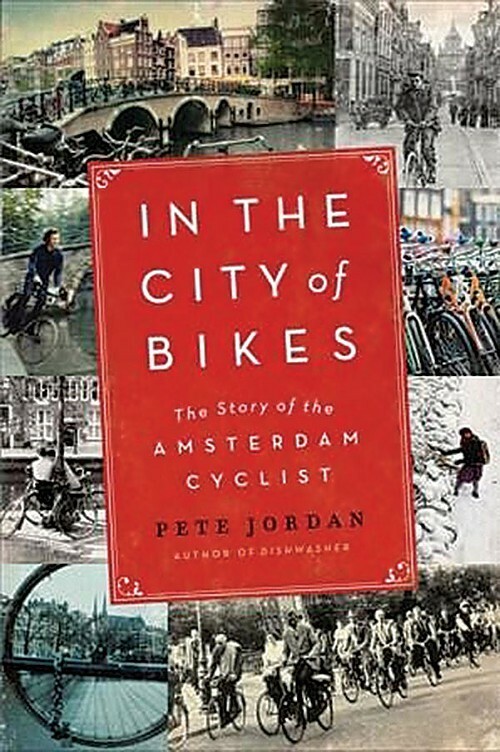 Jordan also cautions against dismissing Amsterdam’s bike-topia as something that can’t be replicated here because it’s “always been this way.” In fact, he says, three decades back the city made a conscious choice to become more bike-friendly, and actually began changing the streetscape to do it. Amsterdam wasn’t afraid to “radically realign the city to promote cycling,” he says. Bike-friendliness in Amsterdam is measured less in painted bike lanes than in bike lanes separated from motor traffic by curbs or other barriers. And there are more of those every month, Jordan says. “They have no problem with taking an intersection out and completely redoing it with a roundabout,” he adds. As part of his nine-city U.S. book tour, Jordan returns to Pittsburgh on Mon., May 6.